Before I begin on the basics of wall framing I'd like to tell you a little story about a fellow carpenter. First I've worked with this guy since high school, you will not find a better carpenter when it comes to framing. This guy carries the biggest headers, fourteen studs at a time, just don't ask him to get on top of the wall plate. If he does happen to get on top of the wall he won't hardly move and the whole building is shaking. Anyway he has worked all over the country including, California, Colorado, Washington, to name a few but he always ends up back here in northern Illinois. The subject always comes up, who is better and faster? He refuses to single out any one place saying this one is better at one certain thing and this one at that and it's still just, wall framing, roof framing, floor framing, studs, plates, headers, joists, and sheathing. The point I'm trying to make is, all carpenters do it different, so if it works well how could it be wrong. 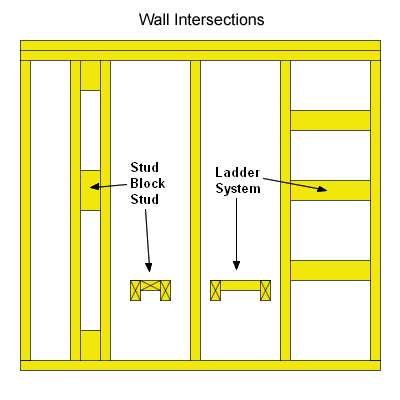 By the time you get to the job site in the morning you should already have an idea of where you will begin framing walls, header list, where to locate studs, etc. I like to have one carpenter start on headers, corners, and window packages etc. 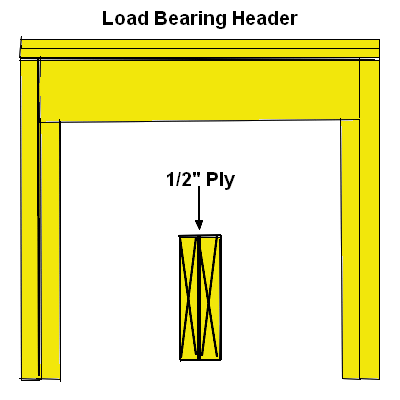 Headers (called lintels by architects) run horizontally over the top of door and window rough openings and support the weight of floor joists, ceiling joists, and rafters from above. Each header has a king stud (full length) nailed to either end and a cripple (trimmer) nailed under each end unless the header is over five feet long then the cripple is doubled up. The standard height of door and window headers is 6' 10 7/8", this could vary so make sure you check your plans carefully. Sliding patio doors are usually 2" lower so you could hold the header down on the studs to the correct height. In normal wall framing rough openings for windows will be found on a separate sheet called the window schedule. To obtain the window header size simply add 3" to the rough opening width and this will be your header length. Door headers are 5" bigger than the callout on the door, so if the print calls for a 2/8 door the header is 3/1. As before sliding glass doors are different and these rough openings can usually be found on the window schedule. Wrapped or pass through openings should be made one inch bigger than the call out, so the header is 4" bigger. Many carpenters cut cripples out of pre cut studs which I consider a waste of lumber. If you leave interior door cripples out until it is time to do back-out its easier to cut the doorways out with a skil saw. I like to use 14' braces on 8' walls, then use them for cripples on interior headers. Standard interior trimmers are 6' 9 3/8" X 2 = 13' 6 3/4" = less waste and more profit. 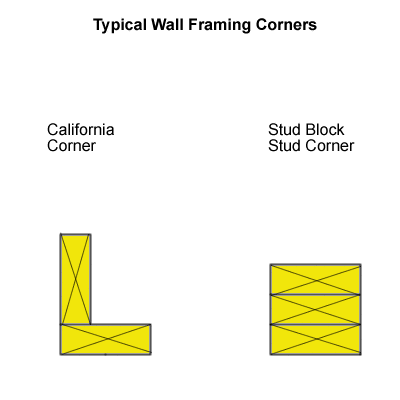 In my opinion there are only two different ways to make outside corners L-shaped (California corner) or stud block stud (old world way). The California corner is the only way to go for many reasons which will be discussed in a later page entitled advanced framing (optimum value engineering). 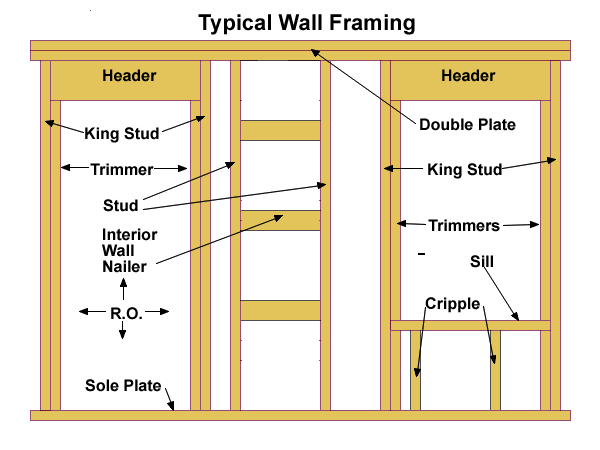 In wall framing where two walls intersect is always another point of discussion amongst framers. Below are two generally accepted ways of getting the job done.